The Basic 952 Front Activated Height Adjustable Footrest from Score is designed to meet the ergonomic needs of a wide range of users. Built to provide many years of reliable adjustment, the heavy metal base is topped by a large 18.5" by 13.5" foot platform which easily provides sufficient space for both feet. If the Basic 952 looks familiar it is because it has previously been sold as the Foot Actuated Height-Adjustable Footrest by Bakker Elkhuizen. This sturdy, easily adjustable footrest features an extensive height range (3.25" to 12") which can meet the height requirements of a wide range of users. The non-locking tilt platform effortlessly shifts to any angle between 0° and 45°, permitting users to freely flex their ankles and change position regularly throughout the workday. Textured tread lines run across the width of the platform to keep feet securely in place. Height adjustment is spring-assisted, requiring users to employ one foot to press the floor-level release bar while the second foot provides the resistance necessary to position the foot platform at any of the 12 available height settings. Caution: The Basic 952 Front Activated Height-Adjustable Footrest should not be used as a foot stool. Do not stand on the footrest. This product uses a powerful spring mechanism. Adjust the height only with the foot, and only when seated. Eliminates Bending and Twisting - As the 952 Front Activated Height Adjustable Footrest can be adjusted simply by using the feet, there is no need for users to risk injury by bending and reaching beneath their desk. The spring-assisted lift means the user just needs to provide a degree of downward pressure in order to raise or lower the foot platform once it is released. Reduces Strain on the Foot and Ankle - Many office workers while sitting position one foot forward of the other, putting the foot into a position called plantar flexion. Plantar flexion shortens the muscles of the backs of the legs. Over time, sustained plantar flexion can cause the calf muscles to become tight and stiff which, in turn, can lead to a range of uncomfortable symptoms in the foot. 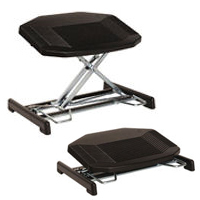 The non-locking platform on the Front Activated Height Adjustable Footrest permits users to flex the ankle joint easily back and forth, promoting healthy movement at the joint, and reducing strain caused by sustained plantar flexion, or sustained dorsiflexion. These frequent small movements also promote better circulation, helping to reduce the risk of blood clots and varicose veins. Improves Upper Body Posture - The Basic 952 Front Activated Height Adjustable Footrest provides users with a stable and supportive surface which encourages users to correctly utilize the back of their chair rather than "perching" on the front edge of their seat. This improved posture can reduce the risk of upper back, shoulder and neck pain. The movement range of the Basic 952 Footrest ensures that even those of shorter stature can reap these benefits. Reduces Negative Effects of Prolonged Sitting - By properly supporting the feet and legs, a footrest takes the pressure off the backs of the thighs and relieves strain on the lower back. Can Reduce Potential Pressure and Restriction of Circulation - Shorter users often have their chair elevated in order to achieve appropriate positioning at the desk. This can leave their legs "dangling" which can result in pressure against the back of the thighs, potentially restricting circulation. A footrest of sufficient height can reduce or even eliminate these pressure points - encouraging unimpeded circulation. Promotes Good Circulation in the Feet and Legs - Non-locking, tilting platforms encourage users to move the feet back and forth, promoting good circulation which can help to reduce the risk of blood clots and varicose veins. Wide Range of Height Adjustment: The wide range of vertical adjustment offered by the Foot Actuated Height Adjustable Footrest makes it well-suited for most users, even shorter individuals. Non-Locking, Tilting Platform: Encourages movement at the ankles and promotes circulation throughout the workday. Simple Spring-Assisted Foot Actuated Adjustment: Users can perform height adjustments with their feet by employing the spring-assisted lift. Eliminating the need for awkward reaching below the desk also facilitates a smooth uninterrupted workflow. Large Platform: The large 18.5" x 13.625" surface on the Basic 952 Front Activated Height Adjustable Footrest provides sufficient surface without crowding, even for larger feet. Slip Resistant Surface: Raised ridges run across the foot platform to aid in maintaining foot position and can provide a massaging effect for feet when footwear is removed. Robust Construction: The Basic 952 Front Activated Height Adjustable Footrest features a heavy-duty steel frame that will last for many years. The foot platform is formed from strong ABS Plastic. Stable: The large steel base on this footrest ensures stability at any height setting. Position your chair to the appropriate height prior to adjusting your footrest. This will ensure that you are able to properly access your worksurface. Once your seating height is selected, then adjust the footrest to a height which positions your knees slightly below your hips. The height should be sufficient to ensure that there are no pressure points against the back of the thighs at the edge of your seat. Employ the tilting footrest to regularly flex your ankles and lower legs. This will encourage circulation in the feet and calves and ensures that you do not sit statically for too long a stretch. Doing this will also ensure that you do not keep your feet and ankles in sustained plantar flexion or dorsiflexion. Since the Basic 952 Front Activated Height Adjustable Footrest employs a coil spring for lifting assistance ensure that you are careful to activate it only when there is sufficient pressure being exerted on the footplate to keep it from "springing" up.